[ATTENTION]New lounge area with multiple entertaining facilities including dart machine, table soccer...etc avaible for our guests at UINN TRAVEL HOSTEL from Jan.1rd. 2017 on! Grab a drink there ane get the party started! Uinn Travel Hostel offers the best accommodation (high-end) amenities such as personal TV and separate bathroom at a budget-friendly price you can find in T-town. Located in one of the busiest areas in Taipei, it takes only 8 minutes of walking from either the MRT(Subway System in Taipei) CKS Memorial Hall station or Guting station. What’s even better about our location is that the most-visited spots such as Presidential Office, CKS Memorial Hall, National Museum of History, Taipei Botanical Garden and night markets…etc are all within walking distance. We offer free map during check-ins and 24/7 front desk service, so feel free to ask us for more travel info at any hour or if you just want to share with us staff about your fun adventures at 2am! Sounds interesting? Wait for it..! 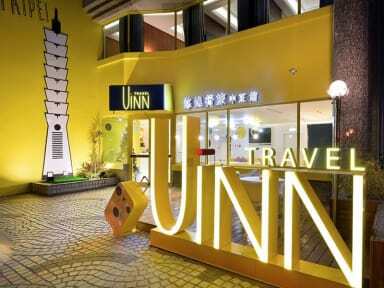 What really separates Uinn Travel Hostel from other hostels in Taipei is that we offer free towels, tooth brush, tooth paste to save you from all the packing hassle. We want you to enjoy the trip to Taipei as much as possible. Also, there is built-in TV for every single bed in case you’re feeling a bit homesick and just feeling like staying alone. At Uinn, breakfast is provided from 7am-10am and juices and coffee are completely free at any time. Can’t wait? Press that booking button right now! See you at Uinn Travel Hostel! ***We have just a few reviews from travelers due to the fact that we just started running our page on HostelWorld right about now. Also, if you have some suggestions or any feedback that you find helpful for us, feel free to put them down as well. We care about every traveler who chooses to stay at Uinn Travel and we want to continuously strive for the better. I may sound clichéd as my other Taiwanese hostels review are perfect - in which I'm going to do the same to Uinn. Great value, great facilities - what can a solo traveler as for more? That's just how Taiwan is. Damn what a fancy place! The capsules were so modern: fully equipped with TV and lights. Whole place was accessible with the card and the lockers were really helpful. They even give you fresh towels everyday which is impressive. Just 10 mins walk to the metro, which isnt too bad. Good place to stay! Great facilities and kind staff. Caters to a wide variety of clientele and age groups. A near perfect hostel! The only thing I didn’t like was the atmosphere—it was mainly older people and there wasn’t much socializing going on, but I guess I have a different expectation having recently come off of the Southeast Asia hostel scene. Overall, this hostel is lovely and clean and offers tons of heat info on the things to do in Taipei. I was there on a 24 hour layover. Great, very clean. Had great suggestions on things to do throughout the city. A nice place. Very easy to find, even if it is not that near to the "center", compared to other hostels. It is spacious. What I really liked is the bathroom since it gives me privacy. Really beautiful and clean hostel. Location is meh. Not much in the area and 15min walk to train station. Dorms are nice but the walls are all metal or plastic which makes noises much louder at night. Also the pull down blind has gaps on the side that light comes in. Not huge deal but didn’t sleep super well. Incredibly friendly and helpful desk staff. Very clean. Close to Chiang Kai-Shek Memorial and Liberty Square. Nearby bus stop takes you to the main Taipei metro station. The hostel provides a decent breakfast. The lockers were great, lots of room. No atmosphere. The basement lounge area was totally empty. The bathroom cleaning stuff could be a little quieter in the morning. The bed pods were very nice, but it could get a little hot. Good facilities, but the ventilation in rooms were non existing. The room had unbelievably mois air. Won't be going back cause of that.